My name is Fu Yan and I live in Tangshan and work in the port. I established the Meijia Public Welfare Network Alliance in China. I really want to learn public knowledge. My WeChat 1220543085. I hope to learn from others. Want to establish learning groups and reading clubs in China. Hope to give support. Can you share a bit about yourself? Are you based in Kenya or China? What sort of work do you do? My job is not related to public welfare. 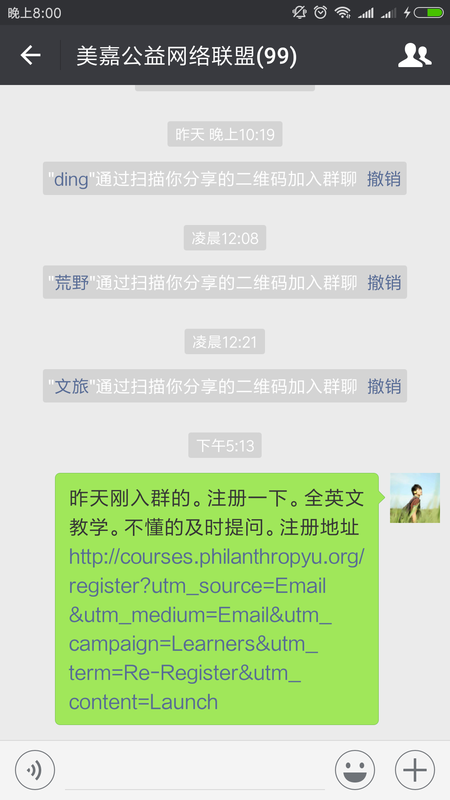 Just a personal hobby, I established a WeChat study group in China to spread your university knowledge. Many people registered this university with my help. I am so glad to get your feedback. To be honest, I am a communication officer instead of a project officer, so my main job is to work on copy writing for campaigns and storytelling for projects. As a communicator, I work closely to Forest and Markets team in WWF China, which hope to have a positive impact on the procurement standards of the supply chain and consumers' consumption behaviors as well as promote kinds of sustainable certification standards like FSC, MSC and etc. Since I hope to be a great story teller in NGO/Philanthropy field, I do have interests in storytelling, social media and visualization, but I also need to learn more about this field. In addition, I do care about the climate change. Wow, sounds like an incredible position and amibition! It's no surprise that you are a communication officer - your English is perfect (比我的中文好得多！）. Where did you learn it? Have you signed up for other Philanthropy University courses yet? Thank you, it is such a huge compliment. I got my Journalism master degree from Indianan University Bloomington, so I did improve my English a lot there. I took Girl Centered Design and Introduction to Fundraising and I feel so excited they are coming! Hi Jason and everyone, my name is Tommy from ShenZhen, China. I just enrolled into the Essentials of Nonprofit Strategy course to learn more about starting a non-profit organization in China for helping smokers especially teenagers to quit tobacco smoking in China. I'm hoping this community can share insights and ideas on how to go about it. Looking forward to learn from you all.